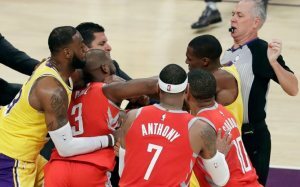 While the NBA was in the process of determining what the appropriate punishment should be taken against those involved in the fight between the Los Angeles Lakers and Houston Rockets on Saturday, some video evidence that has emerged is not going to help Rajon Rondo any. After Rondo got into a confrontation with Chris Paul, CP3 claimed what sparked the whole thing was Rondo spitting in his face. While the live broadcast did not appear to show that, a slow motion replay that the Rockets have sent to the NBA league offices indicates Paul was telling the truth. The incident led to both players and Laker Brandon Ingram, who also threw punches, being ejected. As expected, the three players have received suspensions each. Ingram and Rondo will miss the Lakers’ upcoming games against the Spurs, Suns and Nuggets with Ingram missing another contest against the Spurs later in the week. Paul will sit out games against the Clippers and Jazz before returning to action. Ingram was also fined $158,816 for the four games suspended. Rondo was fined $186,207 for three games suspended and Paul $491,782. The beef between Rondo and Paul apparently got even more personal after their actual physical altercation on Saturday night. Shams Charania of The Athletic reported that a member of Rondo’s family also confronted Paul’s wife, Jada, in the wake of the brawl. The report was corroborated by the Houston Cronicle’s Jonathan Feigen, who noted that the Rondo family member made “inappropriate” comments to Paul’s wife in the stands after the altercation.